Steve Ross (McRae GM1) has taken on the mantle of man-to-beat in this season’s MSC NZ F5000 Tasman Cup Revival Series after dominating qualifying and winning the first race at the fifth round at the Skope Classic motor racing meeting in Christchurch today. At the first two rounds of the 2014/15 series in Australia late last year it was Sydney Chevron B24 driver Tom Tweedie who set the pace and won the majority of the races. 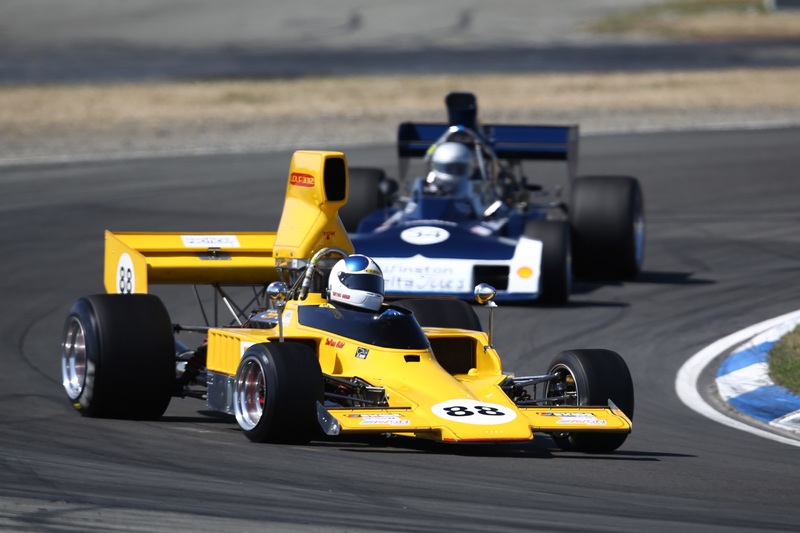 At the two Gulf Oil Howden Ganley F5000 Festival meetings back home last month, meanwhile, it was series’ super-vet Ken Smith (Lola T332) who qualified quickest and claimed a clean-sweep of all the MSC NZ F5000 Tasman Cup Revival Series races. With Tweedie only contested the MSC races in his home country, and Smith choosing not to come south this year, it was two-time former series winner Ross whose time had come today. The Dunedin man was by far the quickest MSC class runner on the track this morning, his 1.18.941 pole time almost one-and-a-half seconds faster than that of series’ returnee Sefton Gibb (Lola T332) who set the second best time. Then in the first 8-lap MSC series race of the weekend later in the day Ross eased away to win by a comfortable margin. Gibb, who has been a series regular in the past but is making his 2014/15 season debut this weekend, was the surprise package, edging out visiting British driver Greg Thornton (Surtees TS11) for the spot alongside Ross on the front row of the grid. But Ross was never seriously threatened in the eight-lap race. “I was able to get enough of a lead and then it was just a matter of bringing it home,” he said. Thornton tried his best to stay with Gibb, but was unable to find a way past and crossed the finish line in third place. Neither Smith nor Hampton Downs’ rival Clark Proctor (who suffered major gearbox issues in his March 73A/1 at the second Festival meeting) made it to Christchurch’s Mike Pero Motorsport Park (nee Ruapuna) for the penultimate 2014/15 MSC series round this weekend. But the field was still 12-strong thanks to the addition of Aucklander Alastair Russell (McRae GM1) and local man Dave Arrowsmith, the latter driving the second David Abbott-owned Lola T430. There was close racing throughout the field as well, with the Lola T332s of Russell Greer, Paul Zazryn and Ian Clements engaged in a race-long tussle for fourth through eighth positions with the Talon MR1s of Auckland pair Aaron Burson and David Banks. Rotorua driver Brett Willis also quickly worked his way up through the order after a broken fuel pump drive saw him miss qualifying and start the race from the back row of the grid. For most of the race Greer led the battle-pack but on the sixth lap he and Zazryn clashed then tangled on the run to the first infield right-hander from the hairpin. Contact saw both cars spin but both were able to get going again, albeit only after Ian Clements, Aaron Burson, David Banks and Brett Willis had got through. 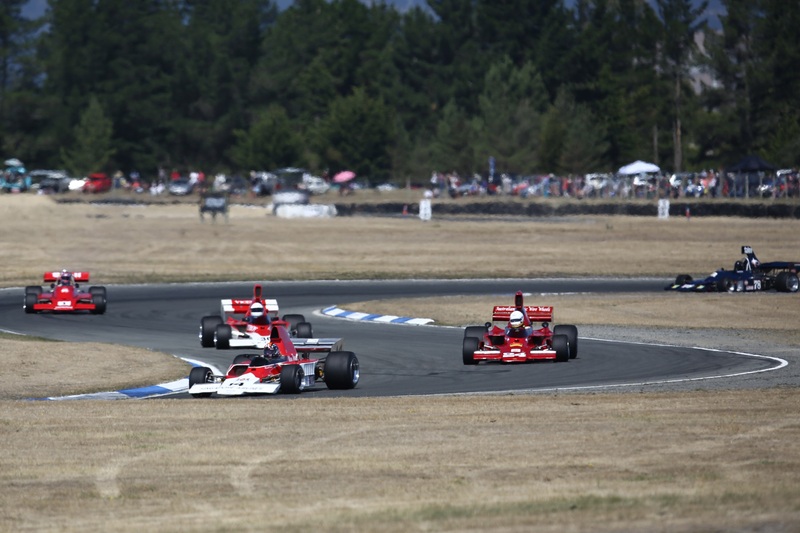 The Mobil1 MSC F5000s have again joined the Harold Heasley Saloons, Stanton Brothers Sports and GTs, PKMC Muscle Cars, Pat Hoare Formula Libres and NZ Pre-65s on a packed programme at the Skope Classic meeting this weekend with a second eight-lap race on Sunday morning then a 15-lap feature final in the afternoon. Dunedin’s Steve Ross (McRae GM1 #5) leads the MSC NZ F5000 Tasman Cup Revival Series field into the first turn at Mike Pero Motorsport Park this afternoon. For most of the race the mid-field battle-pack consisted of Russell Greer, Paul Zazryn and Ian Clements in their Lola T332s and Aaron Burson and David Banks in their Talon MR1s. Enjoying his most competitive showing in the MSC series to date today was returnee Sefton Gibb from Napier in his Lola T332 # 88, seen here leading Greg Thornton (Surtees TS11). Photo credit: Fast Company/Alex Mitchell.